The American bald eagle is the classic inspirational symbol of magnificence and splendor. Regal and powerful are these eye arresting sculptures that denote the absolute pinnacle of leadership qualities. 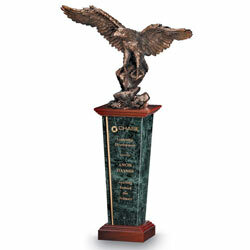 Each eagle is finished with copper plating over cast resin, which serves to highlight the abundant artistic details. A most aesthetic mixture of images and media that captures the stately spirit of this soaring raptor. Presentation / Gift box included.